Not all sizes are available in all styles, please check individual listings. Your wetsuit keeps you warm by trapping water against your skin, if this water can flush in and out you don't stay warm, you get cold. • Firstly check the size charts. Every manufacturer uses a slightly different standard. Please do not use your clothes sizes to fit a wetsuit, they don't always translate, just because you buy a medium tee shirt doesn't mean you're a medium wetsuit. • The torso length fit is quite important, too long in the body and the wetsuit will open up at the back of the neck allowing water to flush in when you are in the water, too short and it pulls open at the front of the neck. • Please do not use your clothes sizes to fit a wetsuit, they don't always translate. Taking the time to measure the body and refering to to tables below can save a lot of time and money. • Please Note: The sizes shown in the listings are the measurements of our suits laid flat and un-stretched. Wetsuits do need to be quite a close fit to work well but not so tight that they restrict movement too much. It is always going to be difficult to get one to your exact measurements but these suits are well tailored and offer a good fit on a huge range of builds. • We always say there is about a 10% stretch in the suit sizes. So if your chest is 44" measured (not jacket size) then a 42" suit will probably be fine. • For children it is especially important not to refer to the stated age as their sizes vary vary dramtically. If anything we are finding that the suits are quite small for the stated age. Using the measurements is by far the best way to save time and money by getting it right first time. This table is designed for average seasonal conditions and water temperatures but the air temperature and especially wind chill on any given day make a huge difference. You could be comfortable in a 4mm wetsuit on one winter's day with calm weather, a little sunshine and average air temperatures and freezing cold the next day if the wind gets up, the temperature drops and the cloud covers the sun. 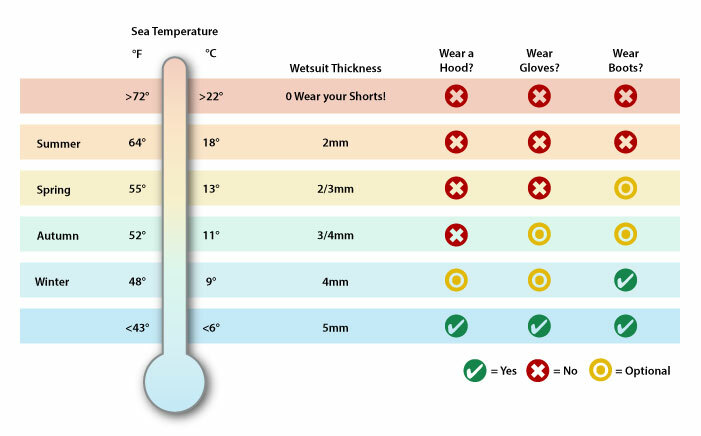 Picking a wetsuit depends on the season. Bear in mind the sea heats up very slowly, the sun can be shining and the air warm for a few months before it makes a real difference to sea temperatures, so the wetsuit seasons always run a bit behind the actual season. Spring is cold in the water even when the sun's shining, a winter wetsuit is worn by many surfers right up until June on a cold year. Once summer comes and the water heats up the warmer temperatures can last right through to the end of October so your summer wetsuit will stay on longer than you might think. The worst winter chill can be around February when the sea has had time to cool to match the air. Picking a wetsuit also depends on your budget, we can't all afford the luxury of a wetsuit to match every condition. • The best option is to have a 3mm, 4mm AND 5mm wetsuit. The lifespan of a wetsuit is directly related to the number of hours it spends in the water so although you'll put more pounds up front ultimately you'll need to replace your wetsuits less frequently so long term you'll spend no more and you'll always be able to pick a perfect match for the temperature. • The majority of surfers own a 'summer' suit and a 'winter' suit. Typically one 3mm and one 5mm. In reality the 5mm probably spends about 7-8 months in the water and the 3mm the rest of the year. • Beginners faced with the means to own only one wetsuit often put their money on a 3mm wetsuit. Bear in mind you will definitely need to upgrade for late autumn and winter. • A 4mm wetsuit often seem the ideal compromise, it's a little warm in the summer and sufferable in the winter. If you're a fair weather water user, likely to sit out the coldest months, it can see you through most of the year. • If you only own one wetsuit, and you want to be in the water as much as possible through the year, a 5mm will probably be the most ideal choice. Being warm in the winter and spring, very warm in the autumn and down right hot in summer. If it gets unbearably hot you can open the neck and flush the suit with cool water, and there is always the option of taking it off. Being too hot in summer is nothing on being too cold in winter.